It’s hard to believe that it was five years ago when Terrence and I decided to start our company. TEEPS began as a simple idea between two friends. Our goal was, and still is, to build world-class mobile applications, curate a local team of creative and driven people and work with awesome companies that want to innovate in their industries. The first two years were slow. We were still holding jobs and wondering if our idea would ever turn into something more than a website and a passion for technology. Five years later, TEEPS has grown into one of the top mobile agencies in Florida and we are not slowing down. We want to share a look back at our journey to this point and thank everyone who has made this possible! 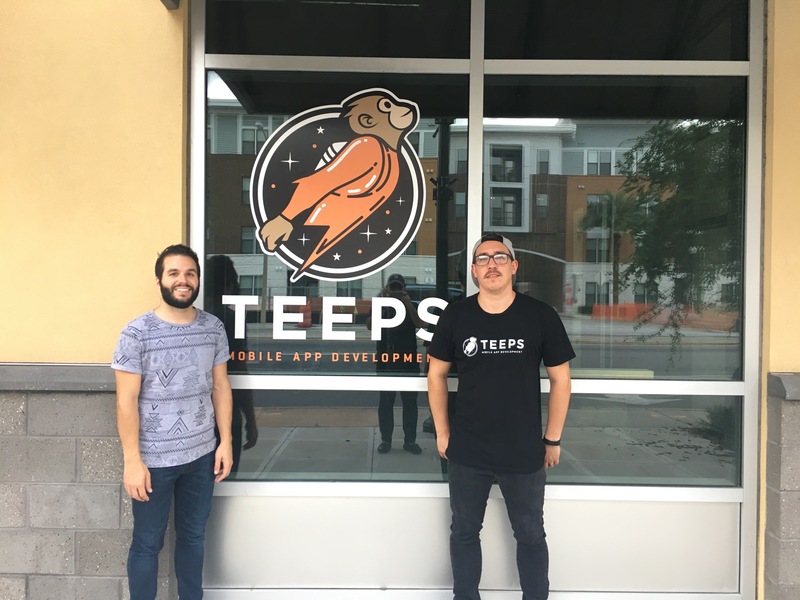 While attending the University of Central Florida, we entered the concept of TEEPS into the UCF Joust Business Competition (and lost) while staying connected with the entrepreneurial ecosystem on campus. We created the company name and branding, filed our papers for an LLC and made TEEPS official. While still working our full time jobs, we landed our first client, an Orlando based bartender training company called Bar Starz. They wanted an app to automate the practice of pouring cocktails while they trained bartenders at Ritz Carltons, Marriotts and other properties around the country. More and more businesses began to reach out for apps through our website and we quickly realized we may need to quit our jobs and pursue our company full time. Tired of meeting with prospective clients at random Starbucks locations, we decided to lease a 500 sqft office in Winter Park. Business began to explode. We partnered with more clients on their mobile apps and eventually had more work than the two of us could keep up with. We thought it might be time to hire someone. We put out an ad and began interviewing developers on campus at UCF while Terrence was building 4 apps at once to help bootstrap the company. Our team doubled in size in a few short weeks as we hired both an iOS and Android developer from Valencia and UCF, creating our first jobs as a company. Our office soon became too small to accommodate our growing team. We took over the suite next door and continued to hire more team members. By this time, we were building products for Code School and exciting startups like Haulzi. People began to notice our hard work. We gave our first interview with Tom Johnson from Fox 35 News, who would eventually become a great friend and colleague. After a few short months, we needed even more space, so we took over another suite and tripled the size of our office. And obviously we needed more chairs, too. We hired a new team member every 5 weeks for nearly a year. TEEPS was recognized for our achievements thanks to the incredible people at UCF, the Blackstone Launchpad and fellow entrepreneurs in the ecosystem, like Jesse Wolfe of O'Dang Hummus. Another milestone was achieved when we officially began offering health, vision, dental and other benefits to our team. Out of room yet again, we knew that TEEPS was in need of not only a new space, but a fresh start altogether. We began working on something that would change TEEPS forever. Meanwhile, we continued to host community meetups. We participated in the UCF Externship program letting incredible students, like Jin, shadow our team and learn about Software Engineering. With heavy hearts, we wished James, our first iOS dev ever, the best of luck as he took his passion and talent to Square, Inc. in San Francisco. With the help of the brilliant folks at Maven Creative, we launched our new brand. Terrence was recognized by Governor Rick Scott with the Young Entrepreneur Award and we traveled to Tallahassee to receive the award. Our team purchased season tickets to the Orlando Magic, which eventually led to a partnership with us building their Mobile Rewards platform. And we celebrated at a Magic game with our team. Knowing we wanted to be downtown, we began construction of a new space being developed by Craig Ustler, the man behind Creative Village, that we planned to call home. We continue to give back and coach UCF students on their startups and entrepreneurial ideas. By fall of 2017, construction of our space on the corner of Orange and Colonial was nearly complete. Today, we are now settling into our new office and planning our grand opening party in early 2018! Our team is looking forward to the big things we have planned for 2018 and we're thankful for our clients and colleagues here in the City Beautiful! Are you looking to innovate your business with an app? Get in touch with us.